26 May: Indian Novels Collective | Rating Roths | Further Nobel delay ? It's always interesting to see what texts composers pick for operatic treatment; Marcelo Figueras' Kamchatka was one I didn't see coming -- but here it is, by Daniel D'Adamo, with a libretto by the author. The New York Opera Fest will present it 5 and 6 June. 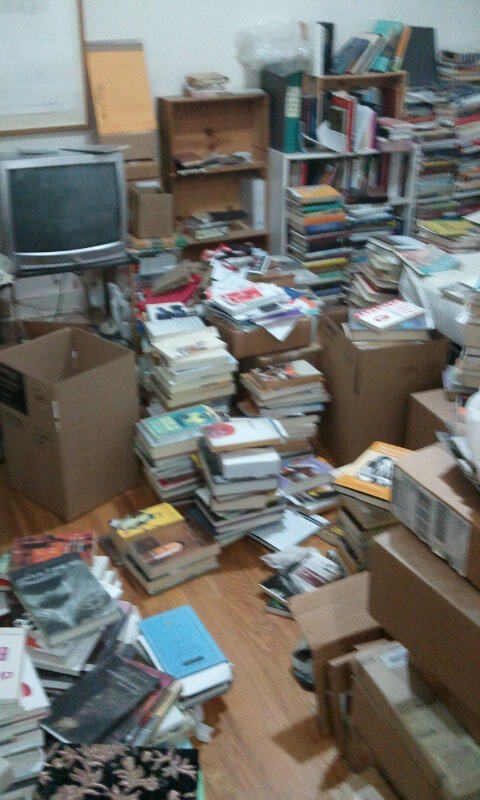 Things are a bit slow at the complete review these days -- it'll be a few days before the next new review is posted -- as I am moving, and am currently consumed/overwhelmed by packing (i.e. packing books -- is there anything else ?). At livemint Seema Chowdhry has a Q & A with Sheldon Pollock, the general editor of the Murty Classical Library of India. There has been some controversy (in India) about a foreigner being in this position, but surely the results speak for themselves -- it's a great series (several titles of which are under review at the complete review, with more to follow). There is a kind of imperialism of English which is worrisome but it is extremely important to acknowledge it and live with. I want every kid to do four years of a classical language, doesn't matter what it is. It is a yoga, a very powerful yoga. It is a discipline of analytical thinking. Stig Abell was named Peter Stothard's successor as editor of the venerable Times Literary Supplement in February 2016, taking over later that spring; in The New York Times Dwight Garner now profiles him and the TLS under his tenure, in A Scrappy Makeover for a Tweedy Literary Fixture. Paid sales from subscriptions and newsstand have been up 30 percent each of the past two years, from some 26,000 in 2016 to nearly 45,000 today. So they're awarding a 'Golden Man Booker Prize', celebrating yet another anniversary. The gimmick this time: five judges each select one favorite winner from each decade in which the prize has been awarded to create a shortlist -- which they've now announced. It's an ... unusual list. Most notable among the omissions is Salman Rushdie's Midnight's Children, which has already won several of these 'best of the Booker'-things (presumably the reason it was left off, to give some other book a chance -- not that its 1980s replacement, Moon Tiger, stands much of a chance here). Not the titles I would have chosen, but, hey, at least Simon Mayo didn't go for Vernon God Little ( or Life of Pi), so it's not nearly as terrible as it could have been. Worryingly, the choice of who wins this thing is now left to 'the public', which has a month to vote on it. The winner, inevitably chosen by Russian bots, will be announced 8 July. Indian Novels Collective | Rating Roths | Further Nobel delay ? To bridge the gap between the English reader and classics of Indian literature by making available quality translations and building reader communities that celebrate Indian storytelling. They aim to release (by January 2019) a shortlist of 100 titles slated for translation -- with the Hindi titles already announced, and with books from the other major Indian languages to be listed soon. At Scroll.in Bhavya Dore writes about the undertaking, in Reviving the past: A literary collective is translating 100 classic novels across Indian languages. The Swedish Academy's goal is to make its decision on the 2018 Nobel Prize in Literature and to announce it together with the 2019 Prize. We hope that this will be the case, but it depends on the Swedish Academy restoring its trust. (Updated - 27 May): See now also Christina Anderson's report in The New York Times, Once Delayed, Nobel Prize for Literature No Sure Thing in 2019. They've announced that the 2018 Princess of Asturias Award for Literature will go to ... popular crime writer Fred Vargas. The award -- until 2014 the Prince of Asturias' award, until he became King and handed off the prize(-name) to Leonor (currently: all of twelve ...) -- has honored some very fine writers, including Philip Roth (2012). Vargas is an ... interesting choice. OK, here's a prize that's almost fifty years old, pays out €200,000, and has honred, among others, Andrei Sakharov and Václav Havel, and writers such as Vargas Llosa and Modiano (both pre-Nobel), as well as Kundera, Borges, Kadare, and both Alejo and Alain Carpentier. You'd figure it would have a higher profile than ... well, when was the last time you heard about the Prix mondial Cino Del Duca ? They've now announced this year's winner -- not that I can find the information at the official site ..., but Livres Hebdo has us covered: it is Philippe Jaccottet. Seagull Books has brought out several of his books; see, for example, the recent The Second Seedtime, translated by Tess Lewis; see their publicity page, or get your copy at Amazon.com or Amazon.co.uk. For all its international aspirations, the prize does seem to lean a bit to the hometown writers -- Wernisch is the fifth Czech winner, of eighteen awarded -- but it's hard to complain too much about the previous ones (Ivan Klíma, Arnošt Lustig, Václav Havel, and Daniela Hodrová), so he's probably worth checking out -- which is easier said than done in English: In the Puppet Gardens, published by Michigan Slavic Publications (!) looks to be the only vaguely available translated title; see the publicity page, or get your copy at Amazon.com or Amazon.co.uk. The Internationaler Literaturpreis - Haus der Kulturen der Welt "honors an outstanding work of contemporary international literature that has been translated into German for the first time" -- and pays out a tidy €20,000 for the author and €15,000 for the translator -- and they've now announced this year's shortlist of six titles; they include Virginie Despentes's Vernon Subutex (the English translation of which was a finalist for the recently announced Man Booker International Prize), Éric Vuillard's not-available-in-English-yet prix Goncourt winner, The Order of the Day, and, one of two translations-from-the-English, Eliot Weinberger's The Ghosts of Birds. Always interesting to see what foreign literature is acclaimed in translation in other countries/cultures, and the ILP-HKW is one of the most impressive foreign translation prizes. The most recent addition to the complete review is my review of Bernardo Atxaga's Nevada Days, which came out in the UK last year (from MacLehose), and which Graywolf Press will be releasing in the US this summer. On the one hand: how awesome that this is translated by Margaret Jull Costa. I truly believe that direct translation from Basque into English would better serve Basque literature. Lots of issues here, but let's face it: direct is the way to go, whenever at all possible (and there's no reason for it not to be possible, especially when we're talking about translation into the world's most popular language, English). Man Booker International Prize | Top 100 'stories' ? As widely noted, they've announced that this year's Man Booker International Prize goes to Flights, by Olga Tokarczuk, in Jennifer Croft's translation. I hope to get to it once it reaches the US; meanwhile, see the Fitzcarraldo Editions publicity page, pre-order your copy at Amazon.com or get your copy at Amazon.co.uk. The BBC has an odd new list of The 100 stories that shaped the world -- whereby almost all the 'stories' are full-fledged books. They invited: "108 critics, scholars and journalists from 38 countries" to each: "nominate up to five fictional stories they felt had shaped mindsets or influenced history" -- and admirably they do at least also show who these folks were, and who they nominated, here. They've announced the longlist for this year's Miles Franklin Literary Award, and along with the latest works by Peter Carey and Michelle de Kretser, Gerald Murnane's Border Districts made the cut. The shortlist will be announced 17 June. Literature in translation in ... Australia | Standard Arabic decline ? At The Conversation Alice Whitmore finds Australia's taste for translated literature is getting broader, and that's a good thing. At the Atlantic Council Hossam Abouzahr considers Standard Arabic is on the Decline: Here's What�s Worrying About That. I hope to hear/read some debate about this. So translation is really all about reclamation, freedom of movement, equality. It evens the territory and levels the hierarchies. In the South China Morning Post Victoria Burrows explains Why China loves Jane Eyre, whether as a feminist manifesto, a history of colonialism or just a simple children's bedtime story. Yes, apparently Jane Eyre -- 简·爱 -- is big in China -- really big. The most recent addition to the complete review is my review of Murata Sayaka's Akutagawa Prize-winning bestseller, Convenience Store Woman, due out in English shortly from Grove Press (US) and Portobello Books (UK).